Peterborough Panthers were supposed to face the toughest test of their sparkling season last night (June 29) . . . instead they picked up arguably their smoothest success yet. The city racers cemented their position at the SGB Championship summit by brushing aside closest challengers Lakeside Hammers 52-38 at the East of England Arena. The two teams went into this top-of-the-table showdown split by only a point in the standings, but the difference between them on track was considerably greater. Panthers were never behind and only very briefly level on a night when they registered a fifth successive victory in all competitions while ending their visitors’ eight-meeting hot streak. Ulrich Ostergaard made a top-scoring return with 12 points gained only 12 days after being fortunate to avoid lasting damage in a frightening spill at the same venue. His contribution headlined a powerful all-round performance and he was joined in double-figures by Bradley Wilson-Dean, who reeled off a hat-trick of heat wins. Two of those arrived when leading home middle-order partner Michael Palm Toft for 5-1s. There were plenty of other pleasing showings from the Panthers camp while the only Lakeside resistance was provided by one-time Panthers rider Richard Lawson and the rapidly-improving Adam Ellis. Lawson racked up 15 points during a full seven-ride shift which saw him take tactical substitute, rider replacement and heat 15 outings in addition to his programmed rides, while Ellis’ 11-point evening was book-ended by victories in his first and last rides. But this night was all about Panthers and their owner Ged Rathbone was predictably delighted with what he saw. “We’ve sent a message out to the rest of the teams in the SGB Championship that we’re here for serious business,” said Rathbone. “We’ve been guilty of making slow starts to previous seasons and we knew we had to address that with there being so few fixtures this year. “We’ve worked hard to get into an excellent position and it has been a real team effort from riders, management and supporters. Three of the opening four races ended in deadlock with captain Simon Lambert triumphing as Panthers edged ahead courtesy of a 4-2 in heat two. Wilson-Dean and Palm Toft both flew past Lakeside number one Nick Morris to claim a 5-1 in the fifth instalment before back-to-back Lawson wins – the second of which helped to earn the visitors a 4-2 as he triumphed while tactical a heat seven tactical ride – kept things relatively close. But that soon changed thanks to a run of five Panthers advantages in the next six races as they ultimately ran out comfortable winners - although they twice saw 5-1s reduced to 4-2s by last-gasp overtaking moves during that surge. Lambert was robbed of second spot in heat eight by Zach Wajtknecht when fellow reserve Tom Bacon took the honours and number one Scott Nicholls had to settle for third in heat 13 after being pipped to the line by Lawson in a race won by Ostergaard. That run of race gains also included a Wilson-Dean/Palm Toft 5-1 in heat nine, a Nicholls-led 4-2 in a re-run 10th race after a nasty spill involving both Lakeside riders (Ben Morley lost control and team-mate Adam Ellis had no chance of taking avoiding action) and a 4-2 in heat 12 from Wilson-Dean and Bacon which clinched victory overall. Panthers now face a two-week break from league racing until they host Scunthorpe on Friday, July 13, but they switch their attention to a trophy defence tomorrow (July 1). The city team are holders of the SGB Championship Fours which take place at Redcar – a venue where they recently triumphed in a league meeting. Panthers are represented by Nicholls, Ostergaard, Palm Toft and Wilson-Dean with Ellis Perks completing his short-term stint with the club by acting as reserve. 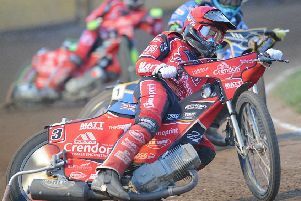 The club will then bring Danish rider Emil Grondal back into their side after he came through a practice session at Alwalton after last night’s success against Lakeside. PANTHERS: Ulrich Ostergaard 12, Bradley Wilson-Dean 11, Scott Nicholls 9, Michael Palm Toft 7+3, Simon Lambert 6+2, Tom Bacon 5, Ellis Perks 2+1. LAKESIDE: Richard Lawson 15, Adam Ellis 11, Nick Morris 5+1, Zach Wajtknecht 4, Ben Morley 2 (withdrawn), Alfie Bowtell 1+1, rider replacement for Kyle Newman.